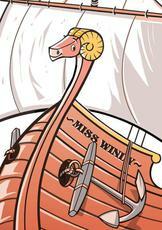 THE WINDY IS A LADY SHIP. SHE LIVES, SHE BREATHES, SHE’S BRASS AND PLANK AND FULL OF SAIL. SHE'S A SHIP WITH A FIGUREHEAD ON HER SHOULDERS THAT PUFFS LIFE INTO HER OAK AND CANVAS RIG. HER HULL’S SO TRIM AND FIT IT’S CAUGHT THE FANCY OF A SEA SERPENT... AND THIS LOVE-STRUCK DRAGON WOOS HIS LADYSHIP ACROSS THE SEVEN SEAS. "I am only one; but still I am one. I cannot do everything, but still I can do something. No pessimist ever discovered the secret of the stars, or sailed to an uncharted land, or opened a new doorway for the human spirit. and rejoiced in the works of their hands."